"The projects" redirects here. For other uses, see Project (disambiguation). Social housing is an umbrella term referring to rental housing which may be owned and managed by the state, by non-profit organizations, or by a combination of the two, usually with the aim of providing affordable housing. Social housing can also be seen as a potential remedy to housing inequality. ... roads were unmade, often mere alleys, houses small and without foundations, subdivided and often around unpaved courts. An almost total lack of drainage and sewerage was made worse by the ponds formed by the excavation of brickearth. Pigs and cows in back yards, noxious trades like boiling tripe, melting tallow, or preparing cat's meat, and slaughter houses, dustheaps, and "lakes of putrefying night soil" added to the filth. Some philanthropists began to provide housing in tenement blocks, and some factory owners built entire villages for their workers, such as Saltaire in 1853 and Port Sunlight in 1888. It was in 1885, after the report from a Royal Commission in England, that the state first took an interest. This led to the Housing of the Working Classes Act of 1885, which empowered Local Government Boards to shut down unhealthy properties and encouraged them to improve the housing in their areas. The City of London Corporation built tenements in the Farringdon Road in 1865, and the world’s first large-scale housing project was also built in London, to replace one of the capital’s most notorious slums – the Old Nichol. Nearly 6,000 individuals were crammed into the packed streets, where one child in four died before his or her first birthday. Arthur Morrison wrote the influential A Child of the Jago, an account of the life of a child in the slum, which sparked a public outcry. Construction of the Boundary Estate was begun in 1890 by the Metropolitan Board of Works and completed by the recently formed London County Council in 1900. The success of this project spurred many local councils to embark on similar construction schemes in the early 20th century. The Arts and Crafts movement and Ebenezer Howard's Garden city ideas led to the leafy London County Council cottage estates such as firstly Totterdown Fields and later Wormholt and Old Oak. The First World War indirectly provided a new impetus, when the poor physical health and condition of many urban recruits to the army was noted with alarm. In 1916, 41% of conscripts were unfit to serve. This led to a campaign known as Homes fit for heroes and in 1919 the Government first compelled councils to provide housing, helping them to do so through the provision of subsidies, under the Housing Act 1919. Public housing projects were tried out in some European countries and the United States in the 1930s, but only became widespread globally after the Second World War. Minha Casa Minha Vida (My House, My Life), the Brazilian government's social housing program, was launched in March 2009 with a budget of R$36 billion (US$18 billion) to build one million homes. The second stage of the program, included within the government Growth Acceleration Program (PAC – Programa de Aceleração do Crescimento) was announced in March 2010. This stage foresees the construction of a further two million homes. Of the total 3 million homes, 1.6 million are for families earning between 0 and 3 times the monthly minimum wage (R$545); 1 million homes are allocated to families with salaries between 3 and 6 times the monthly minimum wage; and the remaining 400,000 homes are for families earning between 6 and 10 times the monthly minimum wage. All funds for Minha Casa Minha Vida properties are provided by the Brazilian public bank, Caixa Econômica Federal. The bank finances development and provides mortgages for qualifying families. In April 2011, the Minister for Planning, Miriam Belchior announced that one million homes were contracted for the Minha Casa Minha Vida in 2010 and that 500,000 homes would be delivered in 2011. The government budget for the programme was R$39 billion in 2010 and R$40.1 billion in 2011. In Canada, public housing is usually a block of purpose-built subsidized housing operated by a government agency, often simply referred to as community housing, with easier-to-manage town houses. Canada, especially Toronto, still maintains large high-rise clustered developments in working-class neighborhoods, a system that has fallen into disfavour in both the United States and the United Kingdom. However, Toronto Community Housing, the second largest public housing agency in North America, has a variety of buildings and communities ranging from individual houses to townhouse communities and mid-rise and high-rise apartments in both working-class and middle-class neighborhoods that house a significant number of low-income Canadians. Following the decentralisation of public housing to local municipalities, Social Housing Services Corporation (SHSC) was created in the Province of Ontario in 2002 to provide group services for social housing providers (public housing, non-profit housing and co-operative housing). It is a non-profit corporation which provides Ontario housing providers and service managers with bulk purchasing, insurance, investment and information services that add significant value to their operations. Recently, there has been a move toward the integration of public housing with market housing and other uses. Revitalization plans for properties such as in the notorious Downtown Eastside of Vancouver, and Regent Park, Lawrence Heights, and Alexandra Park in Toronto, aim to provide better accommodations for low-income residents, and connect them to the greater community. In Toronto, for instance, the aims of the reconstruction plans of Regent Park are to better integrate it into the traditional grid of streets, improve leisure and cultural amenities, and construct mixed-income buildings. However, the residents of these communities have had little effective input in the plans and have had mixed reactions to the construction. In 2014, the City of Vancouver, long considered one of the least affordable cities in the world, changed the definition of social housing to mean rental housing in which a minimum of 30 percent of dwelling units are occupied by households that cannot pay market rents, due to lack of income. At the end of the Second World War, enriched by US investments and an oil boom, Mexico had its first demographic boom, in which the primary destination for rural immigrants was Mexico City. Mario Pani Darqui, a famous architect at time, was charged to build its first large-scale projects. Built for the Dirección de Pensiones Civiles y Retiro (the National Pensions office, today ISSSTE), the Centro Urbano (or Multifamiliar) Miguel Alemán (1947–50) and the Centro Urbano (or Multifamiliar) Benito Juárez (1951–52), both in the Colonia Roma, introduced formal ideas from Le Corbusier's Ville Radieuse into the urban fabric. His later project, the Conjunto Urbano Tlatelolco Nonoalco built in 1960–65, was meant to develop one of the poorest parts of the city, Santiago Tlatelolco, which was becoming a slum. Unfortunately, after a while, instead of giving the residences to the previous residents of Tlatelolco, corruption took place and most of the dwellings were handed to state employees. During the earthquake of 1985 both the Benito Juárez and Nonoalco-Tlaltelolco complexes suffered major damage, with some buildings collapsing. Today most of the Multifamiliar Benito Juárez has been demolished. Mexico has had experience with housing projects since Porfirio Díaz's regime. One of those still remains and is the Barrio of Loreto in San Ángel, Álvaro Obregón, D.F., that was a project for a paper factory workers. In the nineteenth and early twentieth centuries, government involvement in housing for the poor was chiefly in the introduction of buildings standards. Atlanta, Georgia's Techwood Homes, dedicated in 1935, were the nation's first public housing project. Most housing communities were developed from the 1930s onward and initial public housing was largely slum clearance, with the requirement insisted upon by private builders that for every unit of public housing constructed, a unit of private housing would be demolished. This also eased concerns of the establishment by eliminating or altering neighborhoods commonly considered a source of disease, and reflected progressive-era sanitation initiatives. Moreover, public housing along with the Federal Highway Program demolished the older, sub-standard housing of communities of color across the United States. However, the advent of makeshift tent communities during the Great Depression caused concern in the Administration. Public housing in its earliest decades was usually much more working-class and middle-class and white than it was by the 1970s. Many Americans associate large, multi-story towers with public housing, but early projects were actually low-rise, though Le Corbusier superblocks caught on before World War II. 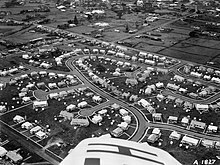 A unique US public housing initiative was the development of subsidized middle-class housing during the late New Deal (1940–42) under the auspices of the Mutual Ownership Defense Housing Division of the Federal Works Agency under the direction of Colonel Lawrence Westbrook. These eight projects were purchased by the residents after the Second World War and as of 2009 seven of the projects continue to operate as mutual housing corporations owned by their residents. These projects are among the very few definitive success stories in the history of the US public housing effort. Public housing was only built with the blessing of the local government, and projects were almost never built on suburban greenfields, but through regeneration of older neighborhoods. The destruction of tenements and eviction of their low-income residents consistently created problems in nearby neighborhoods with "soft" real estate markets. Houses, apartments or other residential units are usually subsidized on a rent-geared-to-income (RGI) basis. Some communities have now embraced a mixed income, with both assisted and market rents, when allocating homes as they become available. The federal Housing and Urban Development (HUD) department's 1993 HOPE VI program addressed concerns of distressed properties and blighted superblocks with revitalization and funding projects for the renewal of public housing to decrease its density and allow for tenants with mixed income levels. Projects continue to have a reputation for violence, drug use, and prostitution, especially in New Orleans, New York City, Philadelphia, Los Angeles, Chicago, and Washington, D.C. as well as others leading to the passage of a 1996 federal "one strike you're out" law, enabling the eviction of tenants convicted of crimes, especially drug-related, or merely as a result of being tried for some crimes. Other attempts to solve these problems include the 1974 Section 8 Housing Program, which encourages the private sector to construct affordable homes, and subsidizes public housing. This assistance can be "project-based", subsidizing properties, or "tenant-based", which provides tenants with a voucher, accepted by some landlords. Neighbourhoods in Puerto Rico are often divided into three types: barrio, urbanización (urbanisation) and residencial público (public housing). An urbanización is a type of housing where land is developed into lots, often by a private developer, and where single-family homes are built. More recently, non single-family units, such as condominiums and townhouses are being built which also fall into this category. (In Puerto Rico, a condominiun is a housing unit located in a high-rise building. It is popularly called an "apartamento" (English: apartment), whether or not its resident owns the unit or lives it as a renter.) Public housing, on the other hand, are housing units built with government funding, primarily through programs of the US Department of Housing and Urban Development (HUD) and the US Department of Agriculture (USDA). These have traditionally consisted multi-family dwellings in housing complexes called a Barriada or a Caserío (and more recently a Residencial Publico), and where all exterior grounds consist of shared areas. Increasingly, however, public housing developments are being built that consist of other than the traditional multi-family dwellings with all exterior grounds consisting of shared outside area, for example, public housing may consist of single family garden apartments units. Finally, a home that is located in neither an urbanizacion nor of a public housing development is said to be located in (and to be a part of) a barrio. In Puerto Rico, a "barrio" also has a second and very different meaning official meaning: the geographical area into which a municipios is divided for official administrative purposes. In this sense, urbanizaciones as well as public housing developments (as well as one or several "barrios" in the popular sense) may be located in one of these 901 official geographic areas. An "Old Public House" in Pengpu Xincun, Shanghai. A low-rent house in Ningnan County, Sichuan. The public-owned housing system was established when the Communist Party of China started the planned economy in the 1950s. Such housing buildings were funded by the central government's budget and were invested, administrated and distributed by state-own enterprises. The households were usually the employees of the enterprises and their family, and were subject to pay the rent at a very low price. The size and the type of room the households get were depending on their job title or administrative level. However, the central government was difficult to continuously invest in those public housing due to its massive cost and low rent; also, the distribution policy that was aimed to be "equalitarianism" results in the misbehavior of corruption. Chinese government commercialized the housing market after the economic reform started in 1978. The public houses that were constructed before that were categorized as "Old Public Houses" (Chinese: 老公房). Those "Old Public Houses" were unable to be merchandised in principle, but the household can sell it after buying the ownership, and such transactions were subject to be reviewed by local housing authorities and State-owned Assets Supervision and Administration authorities. However, the vulnerable policies and low-informalized filing system resulted in the problems of corruption and family dispute. In the recent years, the government provides public housing through various sources, such as new housing, abandoned properties, and old flats which are rented at a low price and called 'Lian Zu Fang' (literally 'low-rent house' or 'low-rent housing', Chinese: 廉租房). Additional housing is built by providing free land and exemption from fees to estate developers: the resulting houses are called 'Jing Ji Shi Yong Fang' (literally 'the economically applicable housing', Chinese: 经济适用房). The concept of the low-cost rental housing can be traced to a 1998 policy statement[clarification needed], but did not truly take off until 2006 due to limited funding and administrative problems. The provision of more affordable housing is one of the key components of China's Twelfth Five-year Plan, which targets the construction of 36 million homes by 2015. That program's costs will be split between the private and public sector and are estimated at five trillion yuan by Chinese investment bank CICC. In Hong Kong, public housing is one of the major housing policies of the government. Nearly half of Hong Kong's 7.8 million population lives in public housing. The two main public housing providers are the Housing Authority and the Housing Society. Indonesia has undertaken One Million Houses program for low-income people. The program has been implementing since 2015 to achieve an ambitious target of building 10 million houses. The proportion of the housing is 70 percent for low-income people and 30 percent for non low-income people. This program is a joint movement between the Central Government, regional governments, real estate developers and the community. The program is targeted to reach one million housing units annually.In 2015, about 700,000 homes were built, increasing to approximately 800,000 in 2016 and around 904,000 by the end of 2017. In Singapore, the public housing program, particularly the planning and development of new public housing and the allocation of rental units and resale of existing ownership units, is managed by the Housing and Development Board. Day-to-day management of public housing communities has largely been delegated to Town Councils headed by the local members of parliament. Most of the residential housing developments in Singapore are publicly governed and developed. Most of the residents in public housing are tenants under a 99-year lease agreement. Public housing was an important issue right from the foundation of the Republic of German-Austria in 1918. The population was faced with a great deal of uncertainty particularly as regards food and fuel. This led to a significant number of less affluent people to move to the periphery of towns, often building makeshift homes to be closer to where they could grow food. They were called Siedler (settlers). As the political situation became stabilised with foundation of the First Austrian Republic in September 1919, the Siedler movement started creating formal organizations like the Austrian Association for Settlements and Small Gardens. The electoral victory of the Social Democratic Party of Austria in the elections for the Viennese Gemeinderat (city parliament) gave rise to Red Vienna. Part of their programme was the provision of decent homes for the Viennese working class who made up the core of their supporters. Hence the German word Gemeindebau (plural: Gemeindebauten) for "municipality building". In Austria, it refers to residential buildings erected by a municipality, usually to provide low-cost public housing. These have been an important part of the architecture and culture of Vienna since the 1920s. Social housing is a responsibility of the regions in Belgium. The regions don't directly own the houses, semi-private social housing corporations do. The government regulates and mostly finances this corporations. Below a certain income limit, people are eligible for social housing. Because there is a major shortage of social housing in Belgium, other priority conditions are often imposed, such as having children to care for. Social housing accounts for approximately 6.5% of the Belgian housing market. This is much lower than neighbouring countries such as the Netherlands and France. As of 2018 Flanders, Wallonia and Brussels are responsible for 280.687 social houses, 212.794 people are on the waiting list. For the people on the waiting list there are other possibilities such as subsidies and sociale rental agencies in Flanders. In Denmark, public housing is called Almennyttigt Boligbyggeri and is owned and administered by approximately 700 self-governing, democratic and non-profit organizations by and for the tenants themselves. Many of the public housing organizations in Denmark are rooted in the early history of the labor unions and currently forms about 20% of the total housing stock with about 7,500 departments countrywide. A membership of a housing organization is usually required to obtain a rental and they are granted with regard to length of membership. Although the buildings are owned and administered by self-governing and economically independent organizations, the State of Denmark is strongly regulating public housing in the country. By law, the municipalities have access to 25% of the rentals, usually reserving them for the poor, the unemployed, the disabled or mentally ill or any other group dependent on social benefits from the municipality. Over the years, these regulations have created many 'especially vulnerable residential areas' – so called "ghettos" – within the country. The Danish Public Housing has never had any income restrictions, but in recent years new state regulations has made it mandatory for several of them to favor fully employed renters and disfavor unemployed or part-time employed people. This is a relatively new effort by the state to counter the ghettofication, which is now an officially recognized problem countrywide. As in Sweden, state and municipal policies carried out throughout the first decade of the 21st century, has led to an increased privatization of public housing. In many areas, residents have been offered to buy their own flats, thereby effectively changing the status of the property. The privatization of public housing was initiated as part of an ideological program by the right wing governments of the early 21st century and was launched a few years after the closure of the former Ministry of Housing Affairs in 2001. The former ministry was re-opened as Ministry of Housing, Urban and Rural Affairs in October 2011, when a new coalition government led by social-democrats was formed. The earliest public housing project in Finland was in Helsinki. In 1909, four wooden houses designed by the architect A. Nyberg were built on Kirstinkuja (formerly Kristiinankatu) for the city's workers. The residents were mainly working-class families with several children. The apartments had an average of five people per room, sometimes up to eight. The tiny apartments were equipped with running water, a pantry and an attic cupboard. Every apartment had its own toilet in the cellar. Electric lighting was installed in 1918. The homes and lives of worker families in Helsinki from 1909 to 1985 are presented in a museum near the Linnanmäki amusement park. It is incorrect to refer to French social housing as public housing. The origins of French social housing lie in the private sector, with the first State aid provided to limited-profit companies by the loi Siegfried in 1793. The originally socialist idea was promoted by some French employers in the 2nd half of the 19th century. Public housing companies followed before the Great War. There are still different social housing movements, public, private and some cooperative. Social landlord organizations all have similar regulation and similar access to government loans but there are significant differences<Much is found in the Code de la Construction et de l'Habitation (the Building and Housing Code), Book IV (with social housing allocation and funding elsewhere in the Code). The government launched a series of major construction plans, including the creation of new towns ("villes nouvelles") and new suburbs with HLM (Habitation à Loyer Modéré, "low-rent housing"). The state had the funds and the legal means to acquire the land and could provide some advantages to the companies that then built its huge housing complexes of hundreds of apartments. Quality was also effectively regulated, resulting in decent or even top quality housing for the standard of the 1950s and 1960s. The construction of HLMs were subject to much political debate. Much smaller developments are now the norm. This housing is now generally referred to as 'l'habitat social' a slightly wider sphere than just housing. France still retains this system, a recent law making it an obligation for every town to have at least 20% HLM. Nowadays HLM represents roughly half of the rental market (46% in 2006). Social housing is not all for disadvantaged people who are just one of the target groups. Part of the funding can be provided by employer-employee groups to provide housing for local employees. The 20% target can include intermediate housing for better off groups, although its object is to produce social mix. Gentrification and the very basis of social housing allocation are divisive issues as well as the extent of local control of housing. This housing has always been a multi-actor activity and recent local government reorganization continues to change the political landscape. While they succeeded in giving lower-income families a place to live in the drive to provide popular housing, this system also led to the creation of suburban ghettos, with a problem of disrepair. There has been a long-term problem of gradual impoverishment of social tenants There, deprived strata of the population, mostly of immigrant origin and suffering massive under-employment, might in the past have been left to simmer away from the more affluent urban centres, sometimes becoming rife with social tensions and violence. This affects a minority of social housing but has a high profile and still produces serious tension. Tackling this problem at its roots is all but simple, and social mix policies can break up populations seen as difficult by redevelopment. This has not had the hoped for results. It has also been sought to resolve the problem of access to the system by disadvantaged people by a new system where certain groups can apply to court to be housed if refused, the 'right to housing'. This tends to intensify the controversy over social housing allocation, who should be housed. The French tradition of 'universal' social housing allocation – housing for everyone is called into question by EU competition rules restricting subsidy except for the disadvantaged. In any event, the system is certainly effective in producing construction, although not with the excesses seen in the recent credit crunch elsewhere. Between 1925 and 1930 Germany was the site of innovative and extensive municipal public housing projects, mostly in Berlin, Hamburg, Cologne and Frankfurt am Main. These housing estates (Siedlungen), were made necessary by the dreadful living conditions of pre-war urban tenements. The right to healthy housing was written into the 1919 Weimar Constitution, but few homes were built until the economy stabilised in 1925. The new German housing estates were low-rise, no more than five stories, and in suburban settings. Residents were provided access to light, air, and sun. The size, shape, orientation and architectural style of Germany's public housing were informed by the recent experience of the Viennese, the Dutch, the anti-urban Garden City Movement in Britain, the new industrialized mass-production and pre-fabrication building techniques, the novel use of steel and glass, and by the progressive-liberal policies of the Social Democrats. In 1930 in the industrial city of Dessau, the Laubenganghäuser ('Houses with Balcony Access') were designed by Bauhaus director Hannes Meyer for a housing cooperative that wanted apartments it could let for no more than a quarter of the occupant's income. Working on a tight budget inspired money and space saving innovations, such as using balcony walkways for access to the apartments rather than having internal corridors and clever use of the internal space in the 47 m² apartments. Bruno Taut, Uncle Tom's Cabin Estate, Wilskistrasse, Berlin. Architects Martin Wagner, Bruno Taut and others built the Berlin Modernism Housing Estates, now a World Heritage Site, consisting of thousands of homes built in and around Berlin, including the Horseshoe Estate (named for its shape), and Uncle Tom's Cabin estate (named after a local restaurant). In Frankfurt the architect Ernst May lead the New Frankfurt public housing project, in which over 12,000 apartments were built 1925-1930. May ran his own sizable research facility to investigate, for instance, air-flow in various floorplan configurations, construction techniques, etc. The Austrian architect Margarete Schütte-Lihotzky applied the principles of Taylorism to the kitchen workspace and developed the Frankfurt kitchen while working for Ernst May. Beyond technical research May also published two magazines and embarked on a significant public-relations project, with films and classes and public exhibitions, to make Neues Bauen acceptable to the public. In the late 1920s the principles of equal access to "Licht, Luft und Sonne" (light, air and sun) and the social effects of a state-guaranteed Existenzminimum("minimum subsistence level") became a matter of lively popular debate all over Germany. One indirect result of this publicity was the American housing movement: a young Catherine Bauer attended one of May's conferences in 1930, and wrote her influential book Modern Housing (1934) based on research done in Frankfurt and with Dutch architect JJP Oud. Increasing pressure from the rising Nazis brought this era to an end in 1933. A majority of the German public housing experts had social democrat or communist sympathies and were forced out of the country. In East Germany, the communist administration built monolithic Plattenbau apartment blocks and estates. Most new residential buildings from the 1960s onward were built in this style, as it was a quick and relatively cheap way to solve the country's severe housing shortage, which had been caused by wartime bombing raids and the large influx of German refugees from further east. Panelház (short form: panel) is the name of a type of block of flats (panel buildings) in Hungary. It was the main housing type built in the Socialist era. From 1959 to 1990 788,000 panel flats were built in Hungary. About 2 million people, about one fifth of the country's total population, live in these flats. The Hungarian government and local municipalities began a renovation program during the 2000s. In the program they have insulated these buildings, replaced the old doors and windows with multi-layer thermo glass, renewed the heating system and colored the buildings in a more pleasant way. In Ireland, public housing and halting sites (sites used by semi-nomadic Traveller communities) have been built by local authorities and are known as Local Authority Accommodation. Dublin Corporation and the former Dublin County Council provided the lion's share of Irish local authority housing, with County Longford having the largest ratio of local authority to private housing in the state. The government has promoted tenant purchase on favourable terms, and many former social housing areas are now completely or almost completely privately owned. Housing associations now play a significant role in social housing provision. As the Irish state's ability to borrow is diminished government policy favours an increased role for private financing of housing associations instead of capital grants for local authorities. In the Netherlands, the rent for the cheaper rental homes is kept low through governmental oversight and regulation. These types of homes are known as sociale huurwoningen. In practice this is accomplished by non-profit private housing foundations or associations (toegelaten instellingen). Due to frequent mergers the number of these organizations dropped to around 430 (2009). They manage 2.4 million dwellings. The majority of the low-rent apartments in the Netherlands are owned by such organisations. Since the policy changed in 1995 the social housing organizations have become financially independent focusing on their role as social entrepreneurs. In most Dutch municipalities there came to exist a certain minimum capacity of social housing throughout the last decades. In many cities such as Amsterdam, The Hague, Rotterdam and Utrecht the percentage of social housing approaches or even passes 50 percent. The public (financial) supervision is done by the central fund for housing (Centraal Fonds Volkshuisvesting). The Dutch housing policy is based on a concept of universal access to affordable housing for all and the prevention of segregation. The skyline of many Romanian cities became dominated by standardized apartment blocks under the former communist government's policy of tower bloc construction. Beginning in 1974, systematization consisted largely of the demolition and reconstruction of existing villages, towns, and cities, in whole or in part, with the stated goal of turning Romania into a "multilaterally developed socialist society". In 2012, 2.7 million flats date from the communist period, accounting for 37% of total housing in Romania and for about 70% in cities and towns. Subsequent to post-communist privatization, the homeownership rate in this form of housing reached of 99.9%. The new Home Owner Associations (HOAs) were challenged internally by the cumulative effect of defaulting contributions, lack of affordability and the established practice of casual resident service in HOAs, which often triggered mismanagement. On the other hand, HOAs were challenged from outside by non-effective mechanisms to address their internal problems, such as non-existent fast court procedures against defaulting, poor financial assistance to socially disadvantaged households and a private sector unprepared to take on condominium management. In the Soviet Union, most of the houses built after World War II were usually 3–5 stories high, with small apartments. In these boroughs, the goal was saving space and creating as many apartments as possible. Construction starting in the 1970s favored 9- and 16-story concrete panel municipal housing in major cities, 7–12 stories in smaller urban areas. Public housing, winner of an environmental design award, in El Astillero, Cantabria, Spain. Spaniards' reluctance to home rental, and government spending cuts in the 1980s, reduced rented public housing in Spain to a minimum. Rented public houses were relatively common in the Franco era (1939–75). With the advent of democracy and the 1978 Constitution, the management of social housing depended mostly on the autonomous regions. This resulted in a wide variety of laws, which make the issue highly dependent on the region. In spite of this, a scheme for viviendas de protección oficial (VPO) has been widely used, consisting of local councils allowing for building contractors and developers to build in public sites or with public loans on condition that a certain percentage of apartments remain subsidized and under control of the local authorities. This is known as VPO de promoción privada (privately developed), as opposed to the VPO de promoción pública (publicly developed), in which the whole property is owned and managed by a government authority. A new plan ("Plan estatal español de vivienda y rehabilitación para el período 2009–2012") was put forward by the Rodríguez Zapatero government, aiming to make near a million homes available for public housing, relying both on new construction and refurbishment of unused houses. Major parts of Spanish cities have been expanded in the last 20 years with projects heavily dependent on public and collective housing projects, which has stressed its importance inside the main architecture schools, that have answered the challenge with the development of several specialized courses and formation plans, such as the Madrid UPM - ETH Zurich combined MCH Master in Collective Housing. Tower block buildings in Rosengård, Malmö. The Swedish public housing is called 'Allmännyttigt bostadsföretag', which is mostly made out of flats owned by the local council. In difference towards its counterparts in for instance Great Britain, the Swedish Public Housing has never had any income restrictions. Instead, for large parts of the period between 1920–1990 (for instance, during the era of Million Programme), the public housing companies such as Svenska Bostäder were the major operators in housing projects as well as in projects aiming to acquire old and worn down buildings. Although not carrying out housing nor acquisitional projects in recent times, the policies lead to a ubiquitous presence of publicly owned buildings throughout the cities of Sweden, including attractive urban areas, with a rather wide range of income among the tenants. Policies carried out in the Swedish cities throughout the first decade of the 21st century have led to the tenants of public housing having bought the publicly owned buildings in which they live, which in turn has led to a significant decrease of publicly owned buildings in attractive urban areas, subsequently leading to an increased development of processes related to gentrification. In the United Kingdom public housing is often referred to by the British public as "council housing" and "council estates", based on the historical role of district and borough councils in running public housing. Mass council house building began in about 1920 in order to replace older and dilapidated properties. Housing was a major policy area under Wilson's Labour government, 1964 to 1970, with an accelerated pace of new building, as there was still a great deal of unfit housing needing replacement. Tower blocks, first built in the 1950s, featured prominently in this era. The proportion of council housing rose from 42% to 50% of the nation's housing total, while the number of council homes built increased steadily, from 119,000 in 1964 to 133,000 in 1965 and to 142,000 in 1966. Allowing for demolitions, 1.3 million new homes were built between 1965 and 1970. To encourage home ownership, the government introduced the Option Mortgage Scheme (1968), which made low-income house buyers eligible for subsidies (equivalent to tax relief on mortgage interest payments). This scheme had the effect of reducing housing costs for buyers on low incomes. Since the 1970s, non-profit housing associations have been operating an increasing share of social housing properties in the United Kingdom. From 1996 they have also been known as Registered Social Landlords (RSLs), and public housing has been referred to as "social housing" to encompass both councils and RSLs. Despite being non-profit based, RSLs generally charge higher rents than councils. However, the Government introduced a "rent re-structuring" policy in 2002, which aimed to bring council and RSL rents into line in England by 2012. Local planning departments may require private-sector developers to offer "affordable housing" as a condition of planning permission (section 106 agreement). This accounts for another £700m of Government funding each year for tenants in part of the United Kingdom. As of 2012, Housing Associations are now also referred to as "Private Registered Providers of Social Housing" (PRPs). 1970s council housing in Haringey, North London. Local authorities have been discouraged from building council housing since 1979 following the election of Conservative leader Margaret Thatcher as prime minister. The Parker Morris standard was abolished for those that were built, resulting in smaller room sizes and fewer facilities. And the Right to Buy was introduced, resulting in the move of some of the best stock from public tenanted to private owner occupation. Since the year 2000, "choice-based lettings" (CBL) have been introduced to help ensure social housing was occupied speedily as tenants moved. This can still favour the local over the non-local prospective tenant. In a number of local authority areas, due to the shortage of council housing, three out of four properties may be designated for priority cases (those living in poor overcrowded conditions, with medical or welfare needs, or needing family support) or homeless applicants in order to meet the councils' legal obligations to rehouse people in need. The percentage of properties set aside for vulnerable groups will vary dependent on the demand for council housing in the area. All local authorities have a Housing Strategy to ensure that council houses are let fairly and fulfil the council's legal obligations; deal with people in need; and contribute to sustainability of housing estates, neighbourhood regeneration, and social inclusion. The 1997–2010 Labour Government wished to move council housing away from local authority management. At first, this was through Large Scale Voluntary Transfers (LSVT) of stock from councils to Housing Associations (HAs). Not all council property could be transferred, as in some local authorities, their housing stock was in poor condition and had a capital value less than the remaining debts from construction costs—in effect, the council stock was in negative equity. In some local authority areas, the tenants rejected the transfer option. The Labour Government introduced a "third way": the Arms Length Management Organisation (ALMO), where the housing stock stays with the Local Authority but is managed by a not-for-profit organisation at arm's length from the Local Authority. It also introduced the Decent Homes programme, a capital fund to bring social housing up to a modern physical standard. To use this fund, the manager, whether ALMO or HA, had to achieve a 2 or 3 star rating from its inspection by the Audit Commission. This was intended to drive up management standards. Council landlords cannot access this funding, another incentive to transfer management of council housing to an ALMO or HA. Governments since the early 1990s have also encouraged "mixed tenure" in regeneration areas and on "new-build" housing estates, offering a range of ownership and rental options, with a view to engineering social harmony through including "social housing" and "affordable housing" options. A recent research report has argued that the evidence base for tenure mixing remains thin. Social housing occupants may be stigmatised and forced to use a poor door that is separate and less convenient than the door the unsubsidised occupants use and social housing may be less desirably situated. Most UK social housing tenants have the right to swap homes with another tenant even if their landlords are different. This is called a "mutual exchange". Public housing high-rise in the Inner-City Sydney Sydney suburb of Waterloo, two of eleven such towers in three different estates spread across the Inner-City Sydney suburbs of Waterloo, Redfern and Surry Hills. The towers are infamously known for their widespread violence, drug addictions and suicides. Public housing in Australia is provided by departments of state governments, with funding provided by both the state and federal government. There are over 300,000 public housing dwellings in Australia, consisting of low-density housing on master-planned estates located in suburban areas, and also inner-city high-rise apartments in Melbourne and Sydney. In recent decades, rooming and relief housing for the homeless has been privatised, and in recent years this housing has been sold off to avoid maintenance costs and capitalise on sales in a booming property market. In Melbourne, public housing stocks have been in decline for some time, sparking the recent Bendigo street housing campaign in which homeless people are being housed by the community campaign in homes left empty by the state government. Unlike many other countries, much New Zealand state housing of the 20th century was in the form of detached single-family houses similar to private housing. This is a 1947 development in Oranga, Auckland. Private companies (such as the New Zealand Company) which fostered early organised European settlement in New Zealand constructed immigration barracks to serve as temporary accommodation for their new arrivals. The Workers' Dwellings Act of 1905 resulted in the Government of New Zealand commissioning the building of 646 houses. In 1937 the First Labour Government launched a major public-housing system—it became known as "state housing"—for citizens unable to afford private rents. Most state housing built between 1937 and the mid-1950s consisted of detached two-to-three-bedroom cottage-style houses; only 1.5% of state houses in 1949 formed part of apartment blocks, all of them in Auckland or in greater Wellington. After World War II ended in 1945, most[quantify] local authorities also started providing social housing, mainly for elderly people with low incomes. ^ a b Hong Kong Census and Statistics Department – Population by type of housing The government provides public housing through flats which are rented at a lower price than the market rate, and through the Home Ownership Scheme, are sold at a lower price. These homes are built and administered by the Hong Kong Housing Authority and the Hong Kong Housing Society. ^ "Bethnal Green: Building and Social Conditions from 1837 to 1875". A History of the County of Middlesex: Volume 11: Stepney, Bethnal Green. 1998. pp. 120–126. Retrieved 14 November 2006. ^ "BOUNDARY OF OLD NICHOL'S VICE, FILTH & DEATH". ^ "To Check the Survival of the Unfit". The London. 12 March 1896. Archived from the original on 12 November 2006. Retrieved 13 November 2006. ^ "A History of the County of Middlesex: Volume 11: Stepney, Bethnal Green". 1998. pp. 126–132. Retrieved 14 November 2006. ^ a b Hollow, Matthew (2011). "Suburban Ideals on England's Interwar Council Estates". Retrieved 29 December 2012. ^ ""Caixa Econômica Federal". Archived from the original on 1 August 2011. Retrieved 28 April 2011. ^ Pablo, Carlito (18 March 2015). "City of Vancouver revisits definition of social housing". Georgia Straight. Retrieved 18 March 2015. ^ "HUDNo.10-112/U.S. Department of Housing and Urban Development (HUD):". HUD. June 2010. Archived from the original on 14 July 2010. Retrieved 16 November 2011. ^ La realidad de las mujeres en las cárceles del país. Primera Hora. 7 April 2014. Retrieved 11 April 2014. ^ Public Housing Projects in PR[permanent dead link] Retrieved November 3, 2009. ^ Los alcaldes de los barrios. Rafael Torrech San Inocencio. "Barrios del Sur." El Sur a la Vista. Ponce, Puerto Rico. 16 January 2011. Retrieved 11 April 2014. ^ 贾绍华. 房地产业健康发展的税收政策研究：基于海南国际旅游岛房地产业的分析 (in Chinese). 中国财政经济出版社. ISBN 9-787-5095-4636-9. ^ "律师房谈：老公房买卖存隐患 户口问题是大难" (in Chinese). 腾讯网. 2014-11-25. ^ "杭州一位小科长能贪19套公房？来看他这些年来的变形记" (in Chinese). 凤凰网. 2017-11-21. ^ "十三、 涉老公房买卖纠纷的调解处理" (in Chinese). 上海市第二中级人民法院. ^ Sun Jianfang (24 October 2011) Will Housing Projects Boost GDP? The Economic Observer Quarterly. Retrieved 9 December 2011. ^ "Jokowi inaugurates low-cost houses in Bekasi". The Jakarta Post. Retrieved 26 December 2018. ^ "Indonesia To Start Implementation Of One Million Houses Program". Antara News. Retrieved 26 December 2018. ^ "Govt to continue 1 million houses program". The Jakarta Post. Retrieved 26 December 2018. ^ "Will Indonesia finally achieve Jokowi's One Million Houses?". Gapura Jakarta. Retrieved 26 December 2018. ^ "Sociale huisvesting: inschrijving en toewijzing". Belgium.be. Federal Government of Belgium. Retrieved 27 December 2018. ^ "Feiten en cijfers over sociale huisvesting". Armoedebestrijding.be. Steunpunt tot bestrijding van armoede, bestaansonzekerheid en sociale uitsluiting. Retrieved 27 December 2018. ^ a b "Fact sheet on the Danish social housing sector" (PDF). Ministry of Housing, Urban and Rural Affairs. Archived from the original (PDF) on 4 February 2015. Retrieved 28 May 2015. ^ a b "Almenboligloven [Law on Public Housing]". retsinformation.dk (in Danish). The Department of Civil Affairs. 24 August 2013. Retrieved 28 May 2015. ^ The Ministry of Housing and Urban Affairs had been in operation for more than 50 years, from 1947–2001. ^ "Ministry of Housing, Urban and Rural Affairs". Ministry of Housing, Urban and Rural Affairs. 29 April 2015. Archived from the original on 5 November 2011. Retrieved 28 May 2015. ^ Hans Kristensen (2 July 2005). "Present and Future Housing Problems in Denmark – and predictable Changes in Housing Policy". Center for Housing and Welfare. Retrieved 28 May 2015. ^ "MCH: Master in Collective Housing". www.mchmaster.com (in Spanish). Retrieved 2018-06-06. ^ "27/01 Rent influencing regime – implementing the rent restructuring framework". Housing Corporation. 22 October 2001. Archived from the original on 13 January 2010. Retrieved 19 December 2012. ^ "Housing association homes". GOV.UK. Retrieved 19 December 2012. ^ Housing. "Choice-Based Lettings". Content under review. Archived from the original on 27 June 2008. Retrieved 14 September 2010. ^ Housing. "Local authority strategic housing role". Content under review. Archived from the original on 28 March 2008. Retrieved 14 September 2010. ^ "Response Paper". Chartered Institute of Housing. 1999. Archived from the original on 21 July 2011. Retrieved 14 September 2010. ^ Lorna Duckworth (9 April 2002). "Council tenants vote against housing transfer plans". Social Affairs Correspondent. The Independent. Retrieved 14 September 2010. ^ "Housing inspections". Retrieved 14 September 2010. ^ For example: Ross, Robert (1843). "Letter from Robert Ross". Letters from Settlers & Labouring Emigrants in the New Zealand Company's Settlements of Wellington, Nelson, & New Plymouth: From February, 1842, to January, 1843. London: Smith, Elder and Company. p. 121. Retrieved 2015-09-30. There were then [in February 1842] no houses [in Nelson] excepting the Company's offices and immigration barracks; but now [November 1842] there are about 1000 [...]. ^ Roche, Michael (2010). "Building Houses in New Zealand under the Workers' Dwelling Act, 1905 and Housing Act, 1919". In Nichols, David; Hurlimann, Anna; Mouat, Clare. Green Fields, Brown Fields, New Fields: Proceedings of the 10th Australasian Urban History / Planning History Conference, University of Melbourne, 7-10 February 2010. Melbourne, Australia: University of Melbourne. p. 530. ISBN 9781921775079. Retrieved 2015-09-30. [...] only 646 houses were ever built under the act, far short of the initial target of 5000 [...].